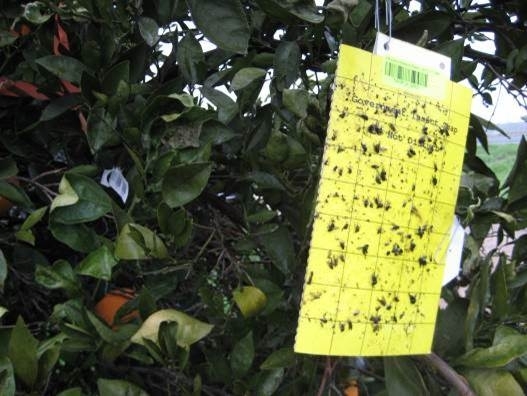 New chemical attractants could make a better Asian citrus psyllid trap. UC Agriculture and Natural Resources scientists based at UC Riverside are honing in on odors that might lure Asian citrus psyllids into traps, and other odors that will keep them away from citrus trees, reported Mark Muckenfuss in the Riverside Press-Enterprise. Anandasankar Ray, professor in the Department of Entomology at UCR, along with two other researchers, published results recently that Ray believes are promising enough they may soon be adapted for grower use. Ray and his team tested three attractant odors in El Monte backyards using yellow sticky traps. More than twice the number of psyllids were found in the scented traps compared to unscented traps, the article said. In time the researchers will also test chemicals that can mask odors that are pleasant to Asian citrus psyllids and some that repel the insects. Other research projects underway at UC Riverside to combat Asian citrus psyllid and the disease it can spread were also noted in the Press-Enterprise article. They are: biological controls, including a tiny wasp imported from Pakistan that feeds on the psyllids; insecticides; developing resistant strains of citrus trees; finding a way to kill the bacteria spread by psyllids once it is in the tree; and discovering ways to identify diseased trees earlier.